The Master of Horror in his most frightening roles! No other name is as synonymous with screen terror as Boris Karloff. After skyrocketing to international stardom in Universal's Frankenstein and The Mummy, this film icon continued to break ground in an electrifying slate of popular horror classics. Now see this unrivaled movie legend in five of his most spellbinding and memorable roles in this collector's set that cements Boris Karloff's status as a true giant of American cinema. Night Key (1937, 78 mins. ): Karloff ignites the screen as the ingenious inventor of a security system who is kidnapped by a gang of burglars and forced to help them commit robberies. Tower Of London (1939, 93 mins. ): Basil Rathbone and Boris Karloff star in this horrifying true tale of a ruthless king's rise to power with the help of his mad and murderous executioner. The Climax (1944, 87 mins. ): In his first color feature, Karloff is terrifying as a mad doctor whose insane jealousy over a beautiful opera singer may once again drive him to murder. The Strange Door (1951, 81 mins. ): As the servant of an evil nobleman, Karloff plots to free the madman's helpless prisoners but finds himself facing the horrors of the dungeon's deathtrap. The Black Castle (1952, 82 mins. ): Karloff is mesmerizing as a doctor who risks his own life to save the captives of a mad count in this gripping tale of betrayal and revenge. The 3-disc DVD set contains five films, offering up a good variety of roles that Boris Karloff played throughout his illustrious career. Disc 1 starts out with the thriller "Night Key", the earliest film in the collection, stemming from 1937 as Karloff plays an inventor and security expert who is kidnapped by a ring of burglars to help them commit their crimes. A film noir, "Night Key" is a great example how Boris Karloff excelled in roles outside the horror genre and his emotional portrayal is absolutely worth seeing. Next up on the disc is "Tower Of London" from 1939, a marvelously dark piece in which Karloff plays an executioner helping expedite the King of England's brother on his way to grab the throne. Basil Rathbone is the main character in this dark thriller and his devious scheming character is taking viewers in from the beginning, but it is Boris Karloff who steals the show as he shows how he could apply a touch of humanity and empathy to even the most morbid figures. Also look for Vincent Price in this film in a nice supporting role. Interestingly enough he revisited essentially the same historic story in 1962 in "Tower Of London" under the direction of Roger Corman, that time playing the leading character. In 1944 Karloff appeared in "The Climax" – his first color feature. Interestingly he appears much older in the film than he actually was at the time, as he plays a forlorn theater doctor whose insane jealousy makes him do things he doesn't really want to do and spends the rest of his life mourning. "The Strange Door" is another gem on the release, though Boris Karloff is once again playing more of a supporting character – a very important one, however - in this film. Starring Charles Laughton as the main character this film oozes menace. Laughton tears up the screen with his trademark portrayal that makes you hate his guts from the first second he fills the frame. I always find it astounding how some actors manage to play heavies that are so evil, so disturbingly maniacal and so utterly disgusting that you could scream. Laughton was an actor who did that regularly and he carries the entire film, in which he kidnaps and kills people at will to satisfy his insane hunger for revenge. Last in the list is "The Black Castle", the 1952 thriller that is rich with the gothic atmosphere of a castle in Germany's Black Forest as Karloff plays a doctor at the castle. A man investigating the disappearance of his friends visits the castle only to find that he comes in the line of fire of the mad count of the castle himself. It is a great film a definitely another highlight of the box set to showcase Karloff's often underestimated versatility, though again he plays but a minor part in the film. 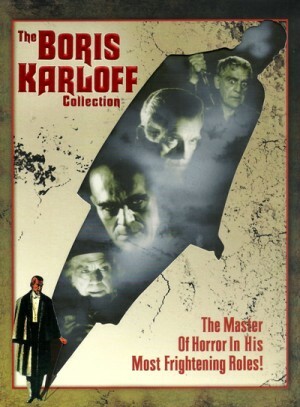 "The Boris Karloff Collection" is a great treasure trove for fans of Universal's classic horror and dark thrillers. While Boris Karloff is not always the top-billed actor and plays only supporting roles in some of the films, he always manages to elevate the films and give them depth, making you look forward to every precious minute he is in the picture. Clearly, for fans, this is a must-have set.